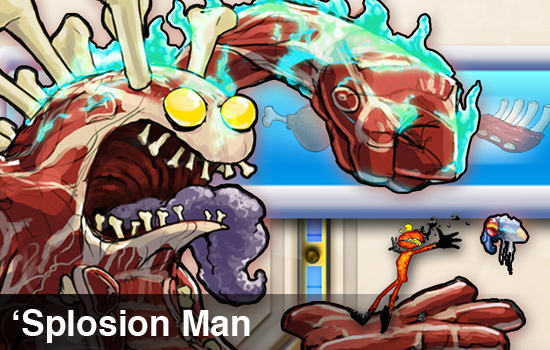 We showed you how much we love splodin in our recent review of the crazy co-op platformer `Splosion Man. We loved it so much we needed to chat with Twisted Pixels Owner and CCO, Josh Bear, about the game, the co-op, and more importantly - the beef. Co-Optimus: What inspired a game like this? It's wholly original, which makes me curious where the idea came from in the first place! It almost feels like it came from a joke at first - "Hey we should make a game where the only button you press is explode." *GROUP LAUGHTER* - "Wait...that's a good idea." Josh Bear: Actually you pretty much nailed it! The first mention of anything called Splosion Man came from our lead designer Sean Riley. We were finishing up The Maw and he mentioned that our next game should be about a dude who splodes in a world made of glass. We all laughed and joked about it a little, and then brought it up in one of our hang-out/pitch meetings we try to have every once in awhile. From there everyone started to pitch in ideas on how we could really make it. It just kind of came together, and we knew we had to make it, because no one else would, lol. Co-Optimus: Along the lines of the inspiration for the game itself, what inspired the creation of a musical track in co-op mode that could only be fully heard by having multiple people exploding? Josh: We did some really cool music stuff in The Maw with composer Winifred Phillips, where she would add new stems of music when the player did something right, so that by the end of the level you could hear the whole composition. I really wanted to put something cool like that in Splosion Man, but not just for the sake of doing it. So when we decided to do 4 player co-op, it seemed natural to do something where the more people that played, the more you were rewarded with new musical stems. Then if a player dies, that music drops out, and maybe subconsciously you start to miss that player and that music. Or probably you are so busy trying not to die you don't even notice, lol. I think John DeBorde, our multiplayer composer for those levels did a great job of nailing it. We also have some cool stuff in the single player campaign with Joshua Mosley's music...everytime you splode an electric guitar stem plays to try to make you feel awesome. The Maw is another Twisted Pixel title featuring a unique character and setting. Co-Optimus: What brought about the decision to include co-op for this title? Was it something that you wanted to include in The Maw and couldn't? Josh: For The Maw we played around with idea of co-op initially, and decided to drop it and focus on what was most important, which was a single player campaign. That isn't to say you couldn't do something awesome multiplayer wise with that game, but it wasn't our focus. 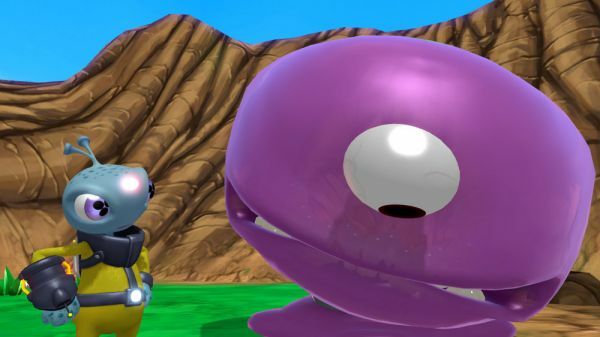 Splosion Man just made more sense from a design standpoint, and it was really important to us that we made sure the multiplayer game had just as much attention. We didn't just want to throw more players in just because we could. So the multiplayer levels are completely unique from single player, and have their own set of challenges to conquer. Also with The Maw we were building our engine from the ground up, so this time we were more prepared to take on the challenge of implementing multiplayer. Co-Optimus: How long did it take to create the carefully crafted cooperative puzzles? Some of the solutions are pretty in depth. Josh:The designers had almost no time at all...for a game with a schedule as short as ours, these guys had to basically whip out a level everyday. Sean Conway, Alex Jones and Sean Riley did a great job with these levels, especially with how awesome most of them are. Sean Conway really took the reins of this and ran with it, and came up with some really clever puzzles. So if there is anything that really pisses anyone off, email all your death threats to that dude. And the level guys couldn't have done anything if it weren't for our tools, which turned out really great and let designers whip out levels very quickly. Hats off to Sean Riley, Mike Henry and Frank Wilson for doing some amazing work. Page created in 0.2680 seconds.